Hello again! I hope everyone has had a great 2018 so far. During January I’ve mostly been focused on “behind the scenes” type of work for the new version of RPG in a Box using Godot 3.0, and I I’ve recently made it through to some of the more interesting editor aspects. There wasn’t really enough content to post one of these detailed updates at the middle of the month, but I have a few cool things to share now! Continue reading for some screenshots and info about what I’ve been working on. This past week I’ve put some focus into getting the basics of the new Map Editor up and running. With a similar approach that I took with the Voxel Editor, I am taking this opportunity to make a lot of usability improvements to the Map Editor and will hopefully end up with an editor that’s easier and more fun to build with! One of the areas of improvement will be the selection tool. 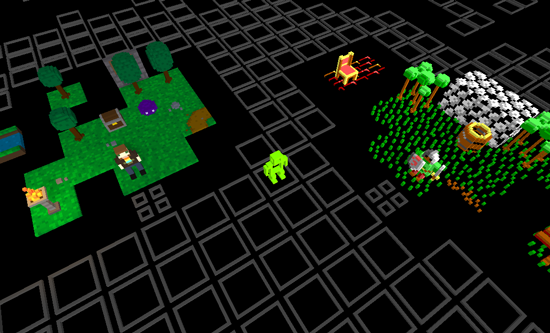 It will have a “box” mode to let you easily select multiple tiles at once, even across multiple layers. The “Place” tool will also be getting some much needed attention. I’ve implemented a “box” mode for this tool as well that allows you to easily place large areas of the same tile at once. In addition to work on the Map Editor itself, I’ve also been making updates to the migration tool, which will allow you to export your existing game projects to v0.5. Currently, the migration tool will convert your tiles, objects, characters, maps, and scripts over to the new format. Maps only include tiles right now, but I will be expanding that out in parallel with the Map Editor functionality. Earlier in the month I spent some time getting most of the functionality and UI converted over to the new Script Editor. The video below is a bit outdated already, but it’s a good representation of the editor’s appearance. I’ve also started adding some new configurable settings for each of the editors as I go, one of which includes the ability to customize the node connection line colors. More recently, I implemented drag-and-drop support for inserting new nodes into the visual script graph! You can still double-click an item to add it to the center of the view, but the drag-and-drop feature will make it easier to initially place nodes where you want them. Also, the “available node” list will now be located on the “Editor Tools” tab to free up some space for the visual script. Not directly related to development, but worth mentioning, is a “Demo Game Hub” idea I’ve been working on as a way for the community to try out some small example/demo games. 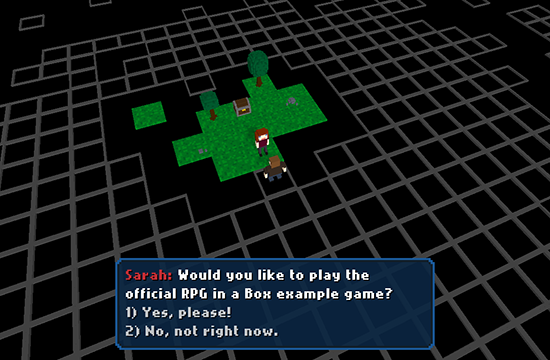 I think this will be helpful in getting a feel for what can be made with RPG in a Box, and the hub will even be a game itself of sorts! The first release of the Demo Game Hub (which I hope to make available this weekend) will include the official example game and Iolo’s hut from Ultima V.
For anyone interested in following my progress on RPG in a Box in real-time, my public Trello board is now up and running! 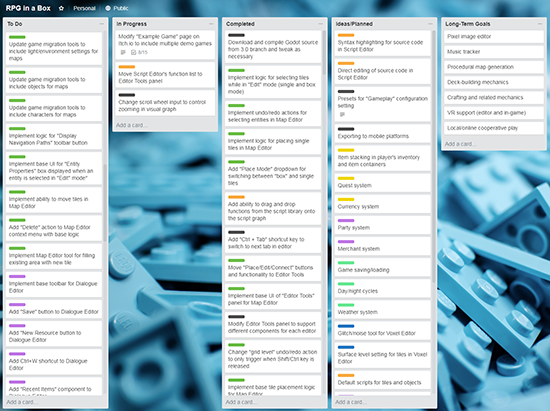 I’ve been keeping the board up to date as I complete tasks each day, so it’s a great way to get insight into what I’m currently working on. On a different note, the Godot 3.0 stable release was on the 29th which is really exciting! Godot is a free and open-source engine and is what I am building RPG in a Box with. I’d definitely recommend checking it out if you’re looking for a general purpose engine or are interested in getting into game development. Kudos to Juan and all of the developers/contributors and the hard work they’ve put into the engine!